"This is a top quality company in every aspect...Outstanding value & enduring workmanship. Always a good experience "
A deck can play an integral part when it comes to summertime entertaining. Unfortunately, decks also are subject to the constant wear and tear that accompanies seasonal changes and shifts in weather. In order to keep your deck and other exterior wood or concrete elements looking their best, be sure check them annually for discoloration, fading, coupling and splittlling. We recommend having the horizontal areas of your deck or patio cleaned with a powerwasher and coated every two to three years. 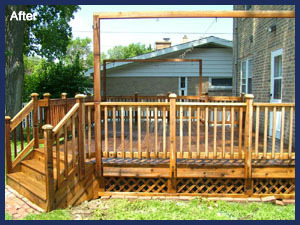 If you need assistance in determining the needs of your deck or patio, give us a call for a free assessment!